We welcomed Chaîne de Rôtisseurs Denmark for a traditional Danish Sunday lunch, served family style with 13 dishes, on Sunday 5 May 2016. 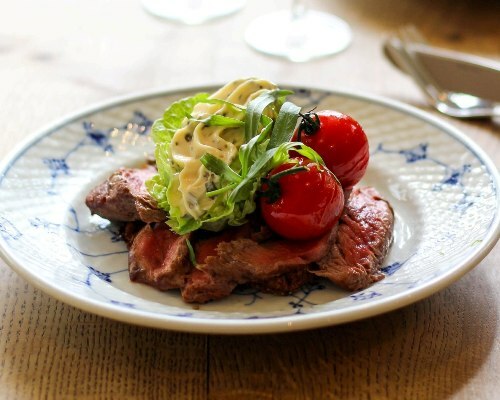 “Restaurant Kronborg, a classic Copenhagen lunch restaurant, recently has sharpened its gastronomic profile while keeping the experience of one of the city’s ‘old school’ places. “Smørrebrød” (English: open sandwich) is served in the honoured Danish culinary tradition. 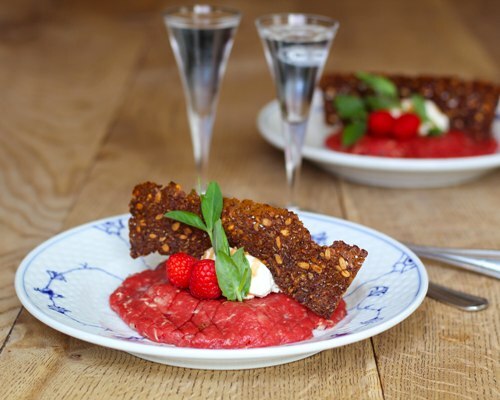 Some claim it is the only truly Danish contribution to world gastronomy,” writes Jørgen Krenk, Bailli Délégué at Chaîne de Rôtisseurs Denmark. 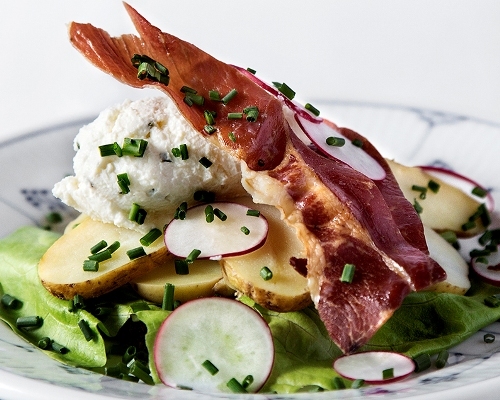 Our Head Chef, Jimmi Bengtsson, celebrates the arrival of the new crop of Danish potatoes – and summertime – by composing some mouth-watering open-faced sandwiches, like potatoes with smoked salmon and herb crème, with ‘granny salad’ and deep-fried anchovies or with oven-baked ham and crème of smoked cheese (pictured). 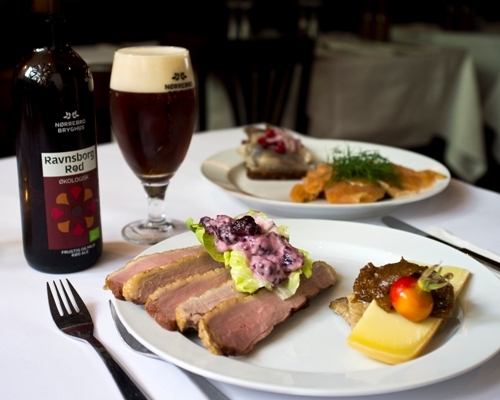 We celebrate Easter with a classic Danish lunch platter with herring, salmon, fillet of place, lamb, roast pork and cheese – preferably with a foaming draft beer from Nørrebro Bryghus and an aromatic Easter aquavit from Kronborg. We celebrate Easter with a lunch platter inspired by the delicacies of the season – and a couple of our guests’ favourite dishes. Our Head Chef, Jimmi Bengtsson, has composed an autumn platter with some of the season’s delicacies, like smoked breast of duck with blackberry crème and Vesterhavsost with compote of hip rose. 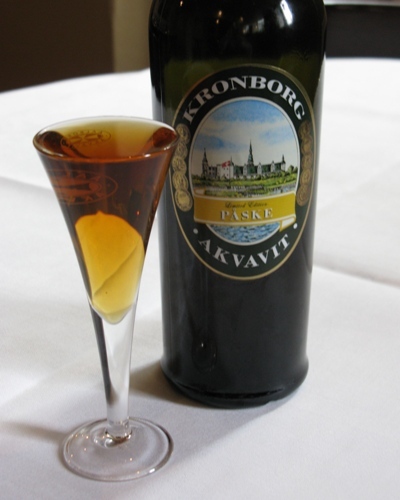 The autumn platter is even better with a full-bodied Ravnsborg Rød and an aromatic Kronborg Akvavit. All at the reasonable price of DKK 215. The autumn platter – or our á la carte open-faced sandwiches – taste even better with a full-bodied Ravnsborg Rød from Nørrebro Bryghus or an aromatic Kronborg Akvavit. We invite you to book your table. Restaurant Kronborg is open 11-17 on Ascension Day, Thursday 17 May 2012. A great opportunity for celebrating the holiday with our delicious spring platter. All this at the reasonable price of DKK 205. 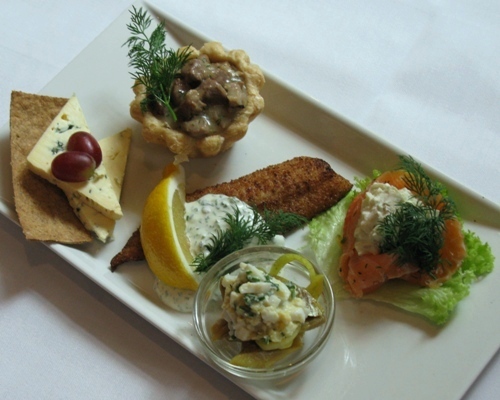 The spring platter – or our á la carte open-faced sandwiches – tastes even better with an aromatic Kronborg Akvavit. Restaurant Kronborg holder åbent kl. 11-17 på Store Bededag, fredag den 4. maj 2012. 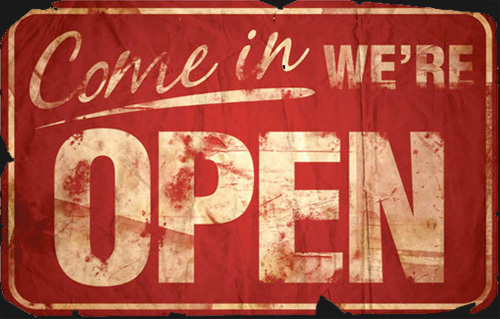 Restaurant Kronborg is open 11-17 on General Prayer Day, Friday 4 May 2012. 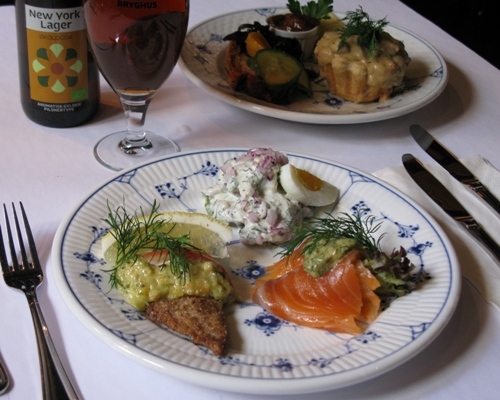 The spring platter – or our á la carte open-faced sandwiches – taste even better with a spicy Kronborg Easter Akvavit. Our Head Chef, Jimmi Bengtsson, has composed a spring platter with some of the season’s delicacies, like fillet of sole and vol-au-vent with dilled lamb. The spring platter tastes even better with a smooth and spicy Kronborg Easter Akvavit. The Easter platter – or our á la carte open-faced sandwiches – taste even better with a smooth and spicy Kronborg Easter Akvavit.